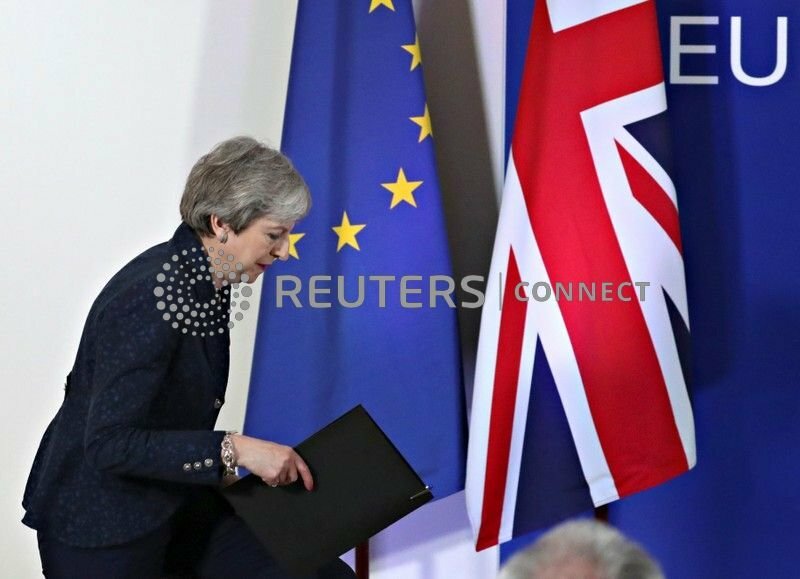 EU leaders were clear that it was now up to the British parliament to decide the fate of Brexit -- to leave with a deal in a couple of months, depart without an agreement, come up with a new plan or possibly remain in the bloc. In an appeal to lawmakers, May said in Brussels: "Last night I expressed my frustration. I know that MPs (members of parliament) are frustrated too. They have difficult jobs to do. I hope we can all agree, we are now at the moment of decision." She needs to change the minds of 75 more lawmakers to get her deal through after it was overwhelmingly rejected twice before. In a letter to British lawmakers on Friday, May hinted she to might not hold a third vote on the deal at all if it was clear it would not be passed. "If it appears there is not sufficient support to bring the deal back next week, or the House rejects it again, we can ask for another extension before April 12," she wrote in the letter published on Twitter by a BBC reporter. While EU leaders were keen to heap pressure on the British parliament, some -- with the notable exception of France --suggested Britain could still win more time to prepare for a no-deal Brexit if lawmakers fail to approve the divorce deal by April 12. European Council President Donald Tusk said: "The fate of Brexit is in the hands of our British friends. We are, as the EU, prepared for the worst but hope for the best. As you know, hope dies last." French President Emmanuel Macron took a potshot at Brexit advocates. "Brexiteer leaders told people leaving would be easy. Bravo." One senior EU official said a no-deal Brexit was more likely. "We are in general well prepared. But we can use these few weeks to prepare more for the rather likely no deal scenario," the official said on condition of anonymity. Parliament will start next week with another vote on Brexit, which business minister Greg Clark said would open the way "for parliament to express a majority of what it would approve". Those May must win over -- eurosceptic lawmakers in her Conservative Party and the DUP, the Northern Irish party that props up her minority government, plus wavering members of the opposition Labour Party -- did not seem to be softening. The DUP's Nigel Dodds said May had missed an opportunity to put forward proposals to EU leaders to improve the prospects of an acceptable deal, describing it as a "disappointing and inexcusable" failure. Seven hours of summit brainstorming on Thursday kept a host of options open for the EU leaders, who say they regret Britain's decision to leave but are eager to move on from what they increasingly see as a distraction. Never before have I seen a country so utterly determined to shoot itself in the crotch. I don't know what else to say; leaving an organization that the UK has been a member of for over 40 years without a transition agreement in place is pure madness. Even in a best case scenario, there will be widespread dislocations, people and families will get hurt, economies will be disrupted, and the smoothness required for proper societal functioning will be harmed. In a best case scenario! I think the UK leaving the EU is a mistake, but that is simply one person's opinion; perhaps it is best for the UK to go. That said, leaving abruptly without a transition plan will certainly cause damage unnecessarily; the truly sad thing is that Johnson, Gove, Farage et al will not be the ones who get hurt, it'll be the proverbial 'little guy' (and UK pensioners in Thailand). This is the worst executed public policy decision that I will ever see in my lifetime. The UK should stop beating around the bush, close it's doors, sort out the paperwork later. I hope this is the start to the end of the EU. Get on with it UK, the sooner, the better. It is sad to see that a so called first world country with such a long history of democracy is ruled by such incompetent people into the current mess. May should hold a speech that she will dissolve the tory party and resign. And then she and the others should try to find proper jobs outside of politics. I know that will be difficult for many of them but they should try. They failed utterly and it's time to end incompetent leadership like this. And yes, the opposition is not much better but at least they didn't start the current mess. And then there are of course those people who have apparently no idea what they are talking about. Crikey ! And all this is for what exactly ? Oh and a tired, clapped out and useless PM chairs the war cabinet every day. Even Prayuth would be better in that role. It is indeed the worst executed public policy decision I too have ever seen. Whatever one may think about the decision to leave the EU (and you and I differ) it was arrived at by as simple a democratic process as can be imagined, That decision was emphatically confirmed by a general election. Since then those charged with executing that public policy decision have tried continuously to thwart it, and have made no real effort to implement it. The result, this "cluster <deleted>". Sure, the UK could leave the EU. But could they leave the EU under the conditions which the politicians promised the people? The promises before the referendum were totally unrealistic and the people voted based on wrong information and impossible promises. It was like: Do you want to leave and keep all the good conditions and have additionally more money and better options around the world. People said yes to that fantasy. But it's just that, a fantasy. It can't be implemented, even by the brightest and best deal makers. Now people who care should be more informed about reality. Let them confirm if they still want to leave, this time based on more realistic predictions. Is anybody scared the voters could make a better decision based on better information? There was no decision! The referendum was advisory only. Look it up! And had it been decisive it wouldn't have been, as it would have been annulled because of all the cheating and fraud. T May's 2nd big mistake (after agreeing to be PM) was to pretend that the referendum was decisive when it wasn't. Another big mistake was to carry on treating the referendum seriously when the frauds became apparent. But what really matters is whether we are better off in the EU than out. I have yet to see a credible argument for better off out.